Macedonian Jews leave the Tobacco Monopoly transit camp in Skopje for the deportation trains. Skopje, Yugoslavia, March 1943. The Jews of Bulgarian-occupied Thrace and Macedonia were deported in March 1943. On March 11, 1943, over 7,000 Macedonian Jews from Skopje, Bitola, and Stip were rounded up and assembled at the Tobacco Monopoly in Skopje, whose several buildings had been hastily converted into a transit camp. 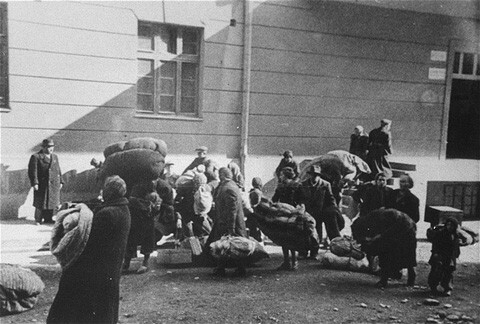 The Macedonian Jews were kept there between eleven and eighteen days, before being deported by train in three transports between March 22 and 29, to the Treblinka killing center.